Gino Ferraro migrated from Calabria, Italy, to Syracuse, N.Y., in 1966. He attended high school there, started down his career path, and met his wife, Rosalba, before coming to Las Vegas in 1976. His idea to open a cafe was about 20 years ahead of the trend. Unable to find financing for a cafe, he focused instead on an Italian foods wholesale business, Italfoods, selling homemade Italian products to pizza parlors, hotels and restaurants. In 1985, the couple opened Ferraro’s as a deli, pizzeria and restaurant-style dining experience. Over the next 30 years, Gino and Rosalba Ferraro would develop Ferraro’s into a fine dining establishment, today on Paradise Road. The restaurant was on Flamingo Road, since 1992, and the couple endured some criticism for moving to Paradise Road in December 2009. The middle of an economic downturn seemed an odd time to move into a larger space. But the restaurant has flourished at the Paradise Road location. Before Gino Ferraro made the transition from a deli-style restaurant to a fine dining establishment, he spent three months in Italy, during tourist season, working and training under Giovani Gattis, a well-known chef in a resort town on the coast. Gino and Rosalba Ferraro’s son Mimmo is an important part of the family business. Mimmo Ferraro was the executive chef at Ferraro’s for a number of years. He and his wife Nikki have expanded the Ferraro family brand by opening quick-serve restaurants at Sunset Station and the Hard Rock Hotel & Casino, called Pizza Forte. 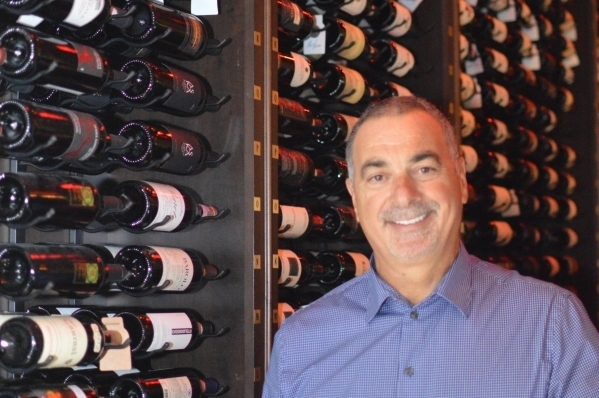 Because Gino Ferraro has a passion for wine his wine cellar and wine list are among the best in the city. This year the Ferraro’s will celebrate 30 years in business here in Las Vegas, a town that’s tough on restaurateurs. Mayor Carolyn Goodman will declare Friday, Nov. 6, as “Ferraro Family Day” in Las Vegas. Q. What are the pros and cons of being married to your business partner? A. We both know our boundaries. She knows that I run the restaurant; not that she’s doesn’t too but, you know, I’m here a lot whereas she’s not. She used to be but boundaries are important. She knows I call the shots in the sense that this is my baby, it’s like raising a baby. There were some tough times where I lose my temper; I take it out on my spouse, you know how it is. … But, you know, there are some difficult times but we understand and know it’s business and when we go home, we kiss. Q. At Ferraro’s, which dish is the restaurant’s staple? A. We have several. Our house specialty is osso buco, but you know we have rabbit that I think is our best dish; tripe that people literally come from Italy to eat. When they come to town they can’t wait to come over and eat the tripe that we sell. Our pastas are made in-house. We have a lot of staples here that have been with us for so many years. Cookies, desserts; they’re all made in-house; pastas are made in-house; sausage meatballs are made in-house. We try to really make everything here. Q. How did the recession affect your business and, do you feel the recession has passed? A. I think the recession of 2007, 2008, 2009 was difficult for everybody in Vegas. That’s when I made the move from being in a neighborhood restaurant on Flamingo Road. I saw it coming. I needed to be closer to the Strip where there’s more traffic. Believe it or not, 80 percent of my business is convention tourism business, so I had to move closer. When I moved here in 2009, everybody thought I was crazy because I was there for 18 years on Flamingo Road. But when I opened, things got really busy and (it’s) been a great move for us. Q. What new is happening at Ferraro’s? A. We opened up a couple of pizza shops, my son Mimmo being the chef. He moved over there where he’s running the pizza shop right now. So he’s involved in that. More to come in the near future. I brought in a chef from Catania, Italy, from Sicily, Francesco. He’s excellent, of course under my guidance. So that I oversee things so that Ferraro will not change drastically. A few dishes here and there as an introduction of the new chef, but our staples will always be here — the rabbit, the osso buco, the homemade pasta — those things will never leave. Q. What do you expect to see in the future? A. Things are changing, in Vegas, in the world, in dining. If you notice a lot of restaurants are now small plates; they don’t like people to be in a restaurant for two or three hours. It’s more like now, quick serve. Even the main hotels, they’re going to small plates because they want people in and out. Our society is changing in dining, I believe, and not for the better. Fine dining, I believe, 10 to 15 years from now, will really diminish a lot.